My fave Indian truck was pulling away as I ran up at 2:00, so I tried this instead. Not a great deal @ $10.00 because 2 pieces of chicken was mostly bones. Potato/spinach side was very tasty, but overall not a great dish for the money. The lamb was nothing but bone and very greasy. The rice w/spinach was cold as if they had just pulled it out of the refrigerator and the salad was welted. This was the worse experience. I should have taken heed when there was no line at this truck. I guess I have to give them one star for quick service. That was only because they had no line and the food was not heated. Thanks for giving me a whole bone with my lamb minus the lamb. For 11 bucks i ordered the Lamb curry and only got a bone with curry. Worst food truck I have gone to. Thanks Kabob Palace! I wish I had read the reviews before purchasing my lamb curry. There was two tiny pieces of meat and several bones - some small enough to be unobserved until you're biting down on them. Very greasy. The salad had no dressing on it, so at least they couldn't ruin that. The lamb curry is a bland, greasy mess. One of the worst curries I've ever tasted. The lamb curry was in a pool of grease and was half bones. I had to pick out the bones from my meal as well as the twig like spices. I had some and throw out the rest. 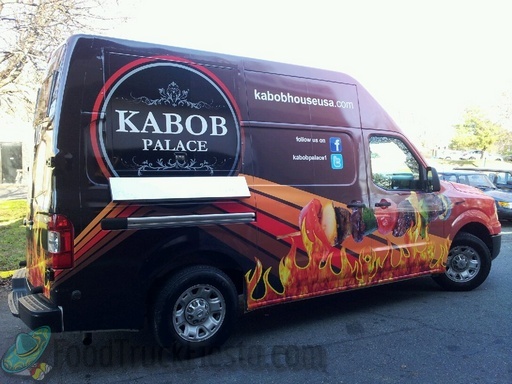 They have signs on their truck that say voted number for kabob. I had a really bad experience. Lesson learned check your food before you pay for it. 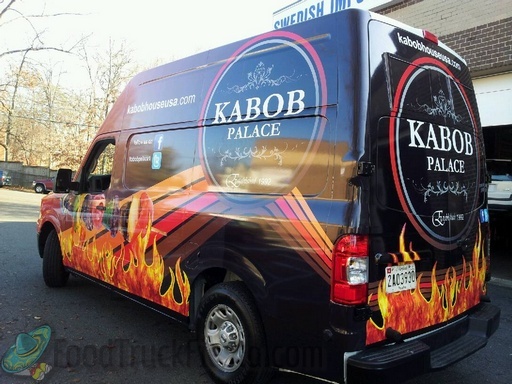 I have been eating at the Kabob Palace in Arlington for years and was so excited to see their truck right in DC! I was worried that it wouldn't taste the same, but they did not disappoint! The chicken curry was just as delicious and flavorful as it was in the store. Worth the money! Our office staff were very hungry so a tech visited and took orders. The truck sent what was the most Horrid I'd ever experienced. 2 chunks of chicken so dry you couldn't force your teeth, fork, or tooth pick thru. Wasted $9.00 and received an abundance of dry rice and chicken. The sauce couldn't even saturate the horrible chicken. To the trash all 3 trays belonged. The man who took my order was very friendly, but this is by far the worst food I've had in 2.5 years of visiting food trucks at Metro Center. I ordered the lamb curry, and what I received were pieces of bone swimming in bad-tasting oil. No, I'm not exaggerating: the "lamb pieces" were almost entirely sawed-off chunks of bone, and the "sauce" did not taste like curry at all. It was almost 100% oil. As in, clear. I wish I had looked in the box before leaving the truck--I would have asked for my money back at one glance. 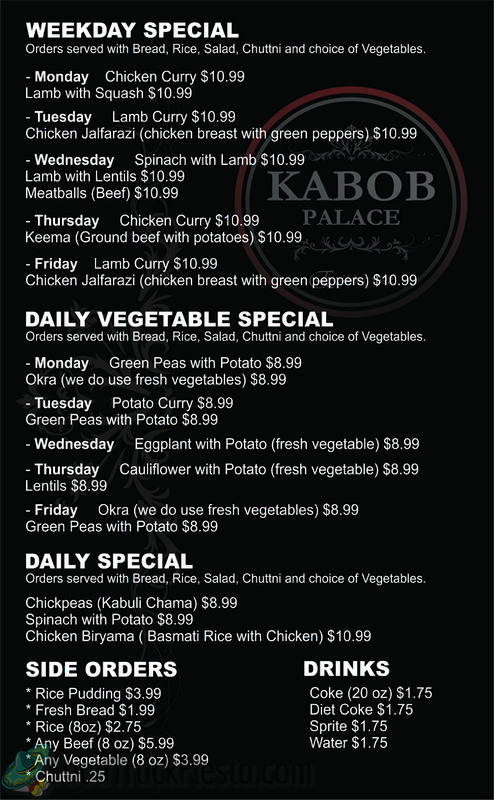 Kabob Palace has been serving out of their brick & mortar location in Arlington since 1992, and now Kabob Palace cuisine can be found on the streets of DC! Using only fresh meat and vegetables, daily specials are prepared and cooked right on the truck. From daily meat specials such as chicken curry, chicken jalfarazi (chicken breast with green peppers, and keema (ground beef with potato) to daily vegetarian specials such as green peas with potato, cauliflower with potato, and okra with potato, we have a wide range of tasty options to please every palate.